Monday night I got to put my cupcake caddy to task by taking cupcakes when I met my pre-grad school workmates for dinner and then my friends for trivia night. Nothing spells dork like showing up at the bar with a pristine white cupcake carrier, but then again I was celebrating being one step closer to a becoming a librarian! Note: this caddy only has room for 12 cupcakes. Who goes anywhere and only needs 12 cupcakes?! Also, the smaller-looking cupcakes were baked in an airbake pan, the others were baked in an older, less fancy tin. 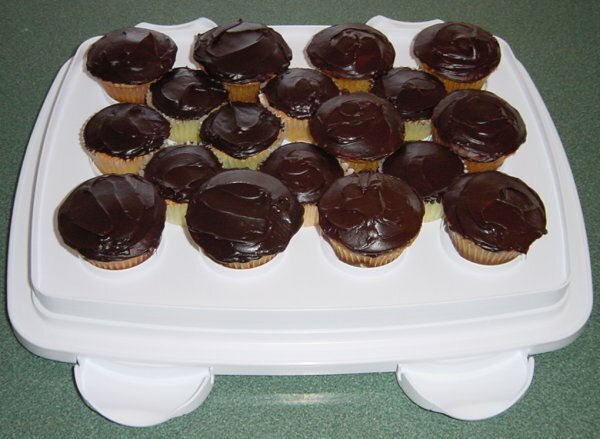 Regardless they all tasted the same because I used the butter golden yellow recipe with chocolate frosting – yum!